Fiction – paperback; Allen & Unwin; 289 pages; 2015. 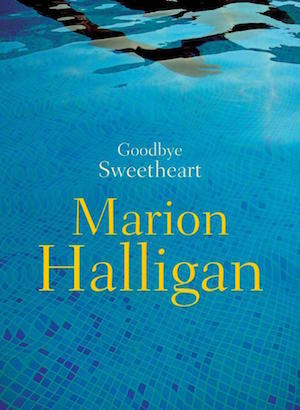 For a novel largely about death, Marion Halligan’s Goodbye Sweetheart is a surprisingly light and delicious read, the perfect treat for this past Bank Holiday weekend. It tells the tale of William Cecil, a well-to-do lawyer in his early sixties, who succumbs to a heart attack and drowns in the swimming pool of his local gym. His unexpected death has repercussions on those who loved him best: his wife, two ex-wives, an adult son, an adult daughter and a teenage daughter, a mistress and an older brother. This set-up immediately suggests a narrative ripe for farce, but Halligan keeps the humour relatively restrained. Though the story is not without its comic moments, everyone’s too nice and too well-behaved to really stir things up. The author, it seems, is more interested in exploring the impact of William’s death on the people in William’s family, as well as the many different faces — father, lover, husband, sibling, bon vivant — he showed to different people. Of course, the person most immediately effected is his current wife, Lynette (or “Linnet” as William so cutely called her, after the singing bird), but she doesn’t grieve as expected. She feels betrayed by her husband’s early demise because it means she needs to take time off from her very successful business, a shop selling kitchenware, which she set up with her friend Janice. But she feels more betrayed by his betrayal when his mistress, Barbara, turns up on the doorstep to offer her condolences. She drowns herself in an endless amount of wine (there’s a lot of wine in this book, it must be said, and it’s usually accompanied by food, whether fish and chips, or great amounts of French cheese and grapes — it made this reader very thirsty!) and then announces there will be no funeral. But all of William’s immediate family, who have gathered in the marital home, often travelling great distances to do so (his son, Ferdie, for instance has flown all the way from London, where he resides), have other ideas: they need some kind of ceremony to say goodbye. And it is to William’s quietly spoken brother, Jack, that this task falls. To describe Goodbye Sweetheart as “frothy” would do it a disservice, but there’s something about the quality of the writing — restrained but sensual, and always with an eye to the senses of sight, touch and taste — that makes it feel less weighty than one might expect for a book about such a serious subject. But Halligan’s deft, light touch makes this an almost joyous read. And despite the themes of death, grief, family and betrayal at its heart, the story is completely free of pity, sentiment — and judgement. Even when writing about Barbara, William’s mistress, whom one could so easily cast as the “demon”, Halligan’s portrait is well-rounded and empathetic. Indeed, Barbara’s situation is drawn with great sensitivity, seeing as she, herself, is grieving for the loss of a child many years earlier. And her reaction to William’s death is perhaps more pronounced than anyone else’s. I particularly liked the chapter devoted to Jack’s back story, which reveals how very different he is to his younger brother. Unlike William, he remains devoted and monogamous to his late wife, Rosamund. The tale of their marriage is sweet and touching, as indeed, is this entire novel. Goodbye Sweetheart is available in the UK in Kindle edition only. It will be published in paperback in the US and Canada on 1 October. Get your order in now! This is my 36th book for #ReadingAustralia2016 and my 24th for #AWW2016. A cautionary tale about how secrets don’t stay hidden after death, eh? I love Marion Halligan! I think I’ve read all her novels (except the Apricot Colonel crime ones). Thanks for the link, Lisa, I’d forgotten you’d reviewed this one. This is only my second Halligan. I like her style, but from my limited exposure to her work she’s totally obsessed by babies! Is that a common theme in her work? Cheers, Brona. I really need to explore her earlier work… she’s a kind of late discovery for me. Sounds like that guy was into shenanigans for sure. Can you imagine a mistress showing up after your husband died?? Funnily enough, Lynette’s not really surprised: she knew her husband had a mistress but pretended she didn’t know, so I guess when the mistress turns up she’s angry at herself for not having nipped it in the bud, so to speak. It’s a really interesting book… would be great for a book group as there’s so much to discuss. Oh, jeez…. My grandma knew my grandpa had a girlfriend, and I never could fathom how a person could live like that. I suppose if you can compartmentalise your life and don’t want to deal with the consequences of confronting your husband and you’re happy to make compromises…. it can work. But, as you say, I’m not sure I could live like that either.